Washington is a fun city to visit and whether you plan to call it home or not, you will find that there are many places to see and cultural events to take part in. One of the most well-known events is “Washington Celebrates America”, which is a huge Independence Day celebration. While visiting, you do not have time to deal with any type of tooth pain. While, unfortunately, tooth pain can be a part of life, it does not have to slow you down and there are many dental options in Washington. Emergencydentistsusa.com wants you to have the resources and information you need at your fingertips, so we have compiled a list of local dentists and specialists in Washington for you. You will be able to identify the exact dentist you need along with their hours of operation and more. If you are in a hurry and you cannot view the list, do not hesitate to call our toll-free dentist finder hotline. Our team members are trained to help you quickly identify the dentist or specialist you need and schedule your first appointment for you. We do recommend that you arrive to your appointment early to fill out any new patient paperwork that the office requires. You should also arrive prepared with your insurance card, copayment, and a valid form of identification. When you need a dentist in Washington, NJ, you need to know that you have choices available to you. Fortunately, there are many choices here and you will find all types of specialists from cosmetic dentists to oral surgeons and more. 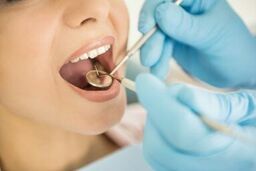 Typically, your first appointment will be with a general dentist and if he or she cannot perform the procedure you need, you will be referred to a specialist who can. Description: At Castle Family Dentistry, we are here for you and your family’s dental needs. We work closely with you to provide the highest quality of care and individualized treatment plans that focus on creating a beautiful and healthy smile for you. We offer digital x-rays, which are beneficial because they expose you to less radiation than traditional options. All of our dental procedures are provided to you in a caring and safe environment where you can feel comfortable. Description: At Warren County Dental Center, we are always ready to welcome new patients into our comfortable and relaxing dental office. Dr. Cannavo has many years of experience and is ready to provide you with the quality care you need. We welcome patients of all ages and have made a commitment to our patients that we will always be there when you need dental care. Description: My Children’s Dentist is a pediatric facility that is focused on caring for infants, children, and teens. We specialize in routine care and dental procedures to ensure your child has a healthy smile for life. We do focus on prevention and teaching children how to properly care for their teeth, so that they have something to smile about for years to come. Tooth pain can be excruciating and it can come on suddenly without any warning. If this happens and you have been in pain for more than a couple of hours, you should seek out immediate dental care from an emergency dentist in Washington. If you have been involved in an accident, you should visit your local ER or urgent care center first to ensure you do not have any serious injuries. Before you visit a new dentist, you should take a moment to verify their credentials, certifications, and licenses. To do this, visit the New Jersey Dental Association and search the dentist’s name. You can also look for the dentist’s credentials in their office, as many of them hang their licenses up in the reception area or patient rooms.